I was saddened to hear that you are unwell. Indeed, the many disturbing reports of your decline have precipitated my writing, for I want you to know that you still have at least one loyal fan. Not someone who uses your name and nuances to strike fear into others. Not someone who uses you as a pointy finger of blame or a ruler for rapping the knuckles of others. Not someone who thinks they’re world-shatteringly stinkin’ smart when they believe they have detected you being mismanaged or ignored in even the most trifling and petty of ways. A grateful fan. A steadfast supporter. I admire how you refuse to be utterly predictable: how there’s an exception to every one of your so-called rules. I relish how you can be both simple and complex, and how working closely with you helps me to say exactly what it is I mean. And I revel in how there is always something more for me to consider, how you grow and change. How organic you are. Please accept my grateful thanks, and my most earnest wishes that you will always have the strength to maintain your steadfast grasp on language. Question of the Day: What kind of relationship do you have with grammar? I am pleased that you are giving encouragement to grammar. Now i know, I am the queen of the typo, and am far too fond of commas and exclamation marks, but I do try! I get personally affronted when an apostrophe is misused, but I don't make too much of a fuss about the mistreatment of grammar, being the serial offender that I am. However, I am learning to have more respect for it and hope that I can help you and others, restore it back to its glory! 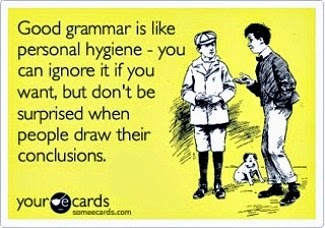 Grammar has an important role in my life. I have to say that English grammar differs from Swedish grammar. So I am sure I can and do make terrible mistakes when I write in English. I am sorry for that dear grammar! I have nothing but admiration for you amazing bi-lingual people. I have some bad French and crappy Indonesian skills... You are genius. Not immensely kind... your work is fantastic. I'm in love with it. You can count on me hanging around to annoy you for a long time to come. And you speak Art... that's a whole other skill. I love grammar. I don't know it formally, but I feel I know it better than I probably do. I probably overstep the mark on occasion, but I'm a confident bluffer. Life will show me where I go wrong. And good friends. I am grammar's champion. It's all I can do to keep from whipping out my virtual red pen to scribble a correction on other people's blogs and Facebook. I've been known to send indignant emails to my local television station when a reporter offends. They're in the communication business, for goodness sake. There's a lot to be said for getting things right the fist time. I am a fan to and your probably wondering weather their our other's. I, like, totally am on you're side on this won. I'm sure I don't know my grammar as well as I should. I try to slink off without making eye contact when I see it, especially when I know I have done something wrong. Even though I never learned to parse sentences because we went on strike when my eighth grade teacher tried to teach us, I love grammar! Your post is terrific. I LOVE that song!!! Also love grammar. I know I make mistakes as I am not a native English speaker, and we dutchies have different grammar rules (especially with commas and apostrophes). I hope you have a wonderful time during the rest of A to Z! Not surprisingly, I LOVED this post!!! And I totally love you Wendy, although I still have occasional nightmares about ... The Hungry Dog project. Picking a bone aside, you're a true grammatical genius who cares more about communication and language than being pedantic. You love writing that sings and that was your main aim while instructing us in the wily creature known as grammar. Moreover, you actually referred me for my first book editing job, which actually led to another author and a couple more books! Quite simply, you ROCK! PS All mistakes made therein are purely my errors and should not reflect on my wonderful first (and probably last) editing instructor. Bugger! Therein should be herein. Lol.